We welcome you to come and stay at Homelands. 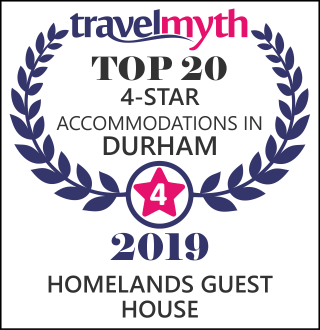 Visitors return year after year to enjoy the beauty of County Durham, the North Yorkshire countryside, Teesdale and The Pennines from the relaxing and luxurious comfort of Homelands Guest House. We are proud of our facility and offer a warm and homely experience with home baked treats on arrival and a delicious breakfast in the morning, prepared by our chef. Our bedrooms are comfortable, with luxurious bed linens and Luxury Toiletries. Homelands Guest House is situated in the market town of Barnard Castle, within easy reach of the Yorkshire Dales and the Lake District, as well as the cultural and shopping centres of Newcastle and Harrogate. The A1 is just 20 minutes away. Barnard Castle has lots of interesting places to shop, from clothing boutiques and food stockists, to several antique shops. A short walk from the town centre is the Bowes Museum. A very grand structure, replicating a French Chateau, has very close ties to the late Queen Mother. The Museum holds nationally and internationally important collections including paintings, prints, sculptures, ceramics, and silver objets d'art, including the famous feeding silver swan. We are close to the Pennine Way, steeped in history, this National Trail chases along the mountain tops along the rugged backbone of England and offers 268 miles of the finest scenery of the finest upland walking in England. A once in a lifetime experience. Way marked walks are in abundance all over the area with several quaint old-fashioned public houses offering good quality food conveniently situated after a thirsty stroll. For those wanting more adventure, the Lake District is only 1 hour’s drive away. Dogs and cats with prior arrangement. Only our Garden Suite is suitable where pets are concerned.